The Wayside in Concord, Massachusetts, a National Historic Landmark, was lived in by three American literary figures: Louisa May Alcott, Margaret Sidney and Nathaniel Hawthorne. Hawthorne, author of The Scarlet Letter, The House of the Seven Gables, and the short story collections; Mosses from an Old Manse and Twice-Told Tales lived here from 1852 until 1870 and gave it the name by which it is still known. While The Wayside is best known as the only home Hawthorne ever owned and the place where he wrote his last works, it has also been the home of several noteworthy women. 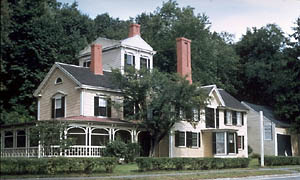 The Wayside, called "Hillside" by the Alcott family, was one the childhood homes of Louisa May Alcott, the author of the 1868 classic Little Women. 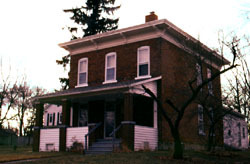 Louisa lived here with her parents and three sisters from April 1845 to November 1848 during her early teenage years. The Wayside barn, which today serves as a Visitor Center and exhibit area, was used by the Alcott girls to stage the plays that were created when they lived at "Hillside"; including "Roderigo" from Little Women. The Wayside exhibit and tour make note of the many events that occurred at "Hillside" that are recalled in Little Women; as well as real life experiences that the Alcott family had here, such as their sheltering of a fugitive slave in early 1847. Mrs. Alcott's family included Judge Samuel Sewall, who wrote an early anti-slavery tract, "The Selling of Joseph" in 1700, and her brother, Samuel J. May was a founder of The American Anti-Slavery Society and a conductor on the Underground Railroad in Syracuse, New York. The Wayside, now part of Minute Man National Historical Park, also pays tribute to the lives of several other significant women. Their stories are included in our Places Where Women Made History travel itinerary. The Wayside, administered by the National Park Service, is located at 455 Lexington Road, Concord, MA, within the Minuteman National Historical Park, one mile east of Concord's Monument Square. For more information, call 978-369-6975, or click here.